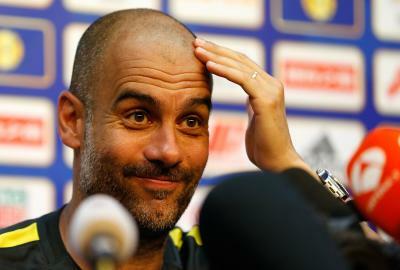 Nashville (US), July 30 (IANS) Manchester City head coach Pep Guardiola reckoned the win over fellow English Premier League (EPL) club Tottenham Hotspur in a pre-season fixture here was the best under his watch and exactly what his club lacked last season. “We haven’t dominated like today, last season we were good, but not in 90 minutes like that,” Guardiola was quoted as saying by the Guardian after Manchester City thumped the London outfit 3-0 here on Saturday evening. “We cannot forget which team we played. Tottenham for the most part of last season played the best football. It’s pre-season, but we didn’t have a performance like that last season,” he added. The 46-year-old also felt that the win over Tottenham, who finished second spot in the EPL last season with 86 points — ahead of Manchester City — will be a confidence booster for his side. “The results are good for confidence and the way we did it, our performance is good. I’m so satisfied, especially in the last two games,” Guardiola said. Guardiola also heaped praise on the physical presence of newly signed right-backs Kyle Walker and Danilo. “You have the quality with Kyle and Danilo, they have that physicality,” the former German football club Bayern Munich coach said.